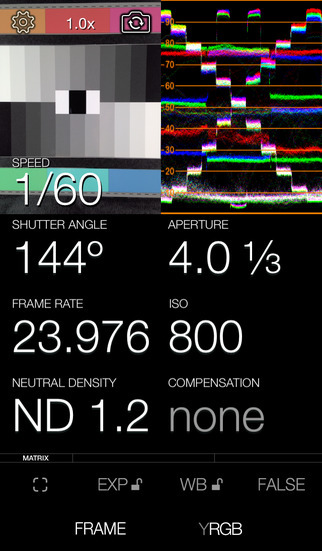 Cinematographer-friendly controls let you set shutter angle, ND filter compensation, and arbitrary filter factors. Use the front-facing camera for “lightmeter selfies” – use yourself as the model when lighting a set (not available on iPhone 3GS). The zoomable spotmeter lets you measure light precisely from a distance (iOS 7 or later only, on iPhone 5, iPod touch 5G, iPad Air, iPad mini 2G, or later devices). Add a Luxi™ photosphere for incident-light readings ($30 from ESDevices for iPhone 4/4S or 5/5S; support for other devices coming soon). See the light: Cine Meter II not only gives you exposure information, it shows you at a glance how evenly your greenscreen is lit, and where high-contrast hotspots and shadows are. With Cine Meter II, you can walk around, light your set, and solve problems long before your real camera is set up, making pictures, and running down its batteries. The light meter shows you your stop as decimal readings (such as 3.2, good for cameras with EVF iris readouts) or full stops and fractions (like 4.0 ⅓, good for cine lenses with marked iris rings). 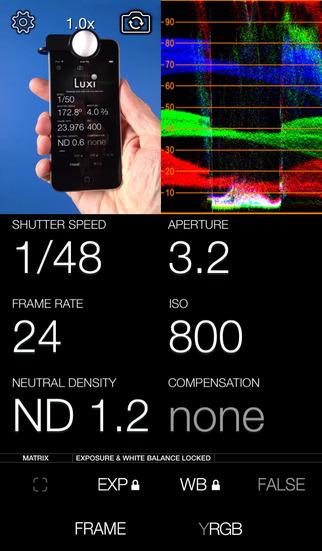 You can meter using shutter speeds, or shutter angles from 11.25º to 360º (especially useful when using Digital Bolex and Blackmagic cameras). 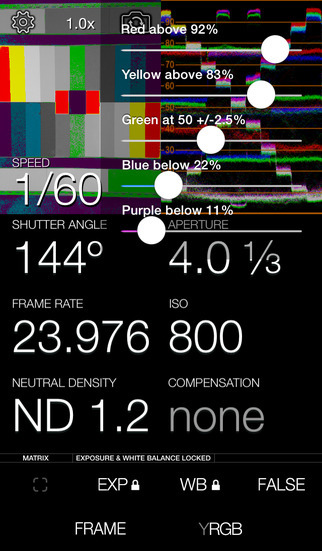 You can add neutral density filter corrections and arbitrary exposure compensations. The waveform monitor shows you how light levels vary within and across a scene. They show you how even the lighting is on a greenscreen or white cove, and let you see hotspots and imbalances at a glance. 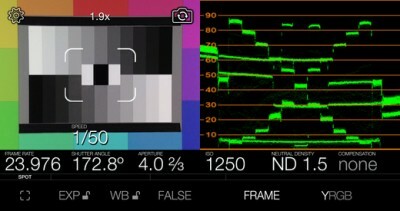 The waveform’s RGB mode shows you color imbalances in the image and gives you a handy way to check for color purity on a greenscreen or bluescreen.